Available in hundreds of fabric choices, this loveseat can also be customized to create a look that you are sure to love. 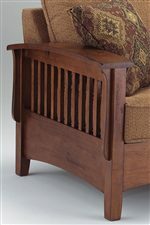 The Westney Upholstered Love Seat by Best Home Furnishings at Walker's Furniture in the Spokane, Kennewick, Tri-Cities, Wenatchee, Coeur D’Alene, Yakima, Walla Walla, Umatilla, Moses Lake area. Product availability may vary. Contact us for the most current availability on this product.